In an ongoing effort to characterize the new, 2017 Ford GT supercar as the high-tech piece of machinery it is, Ford has put out an info graphic pointing out just some of the 25 onboard microprocessors that the production model will be equipped with, which read as much as 100GB of data or so every hour – up to 300MB per-second. 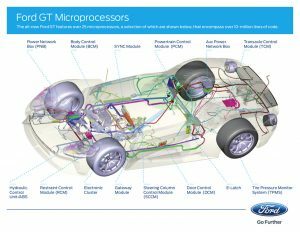 But as with the sensor info graphic that we reported on yesterday, the Ford GT microprocessors highlighted here seem almost disappointingly ordinary. Things like a Tire Pressure Monitoring System (TPMS), a door control module, or a body control module are hardly rarities in the modern automobile. Likewise, a “gateway” module is nothing more than a central microprocessor which allows for communication between all the other various computerized systems. Info graphic. Click for larger image. What will truly be illuminating is if we manage to learn more about the new Ford GT’s powertrain and transaxle control modules – details such as how the former controls fueling, ignition, and turbocharger boost differently from the unit headed for, say, the new Ford F-150 Raptor, or how the latter module plans and executes shifts depending on vehicle drive mode. Alas, such details might be considered trade secrets, whoever spills them branded enemies of the manufacturer. We aren’t holding our breath.